BritainAndAmerica.com plans to run more video campaigns like A World Without America. If you would like to be kept in touch with these campaigns please register here and choose to receive email updates on new campaigns from 18DoughtyStreet.com. PS AWWA has now been viewed 184,058 189,427 205,650 times (on 18DoughtyStreet.com and YouTube) and has featured prominently on TV and radio. If you would like to make a financial contribution so that 18DoughtyStreet.com can make similar adverts in the coming weeks and months please do so via the PayPal button below. The 18DoughtyStreet.com and BritainAndAmerica.com ad depicting A World Without America was the most discussed ad on YouTube yesterday. 125,000 people have viewed it on YouTube already and well over 20,000 people have watched it on 18 Doughty Street. Thanks to 'DarthProphet' you can watch Tim Montgomerie's appearance on Fox News yesterday when he discussed the ad (click on the video below). Tim is a Director of 18 Doughty Street and edits BritainAndAmerica.com. Members of the Doughty Street team discuss the video's impact in this 15 minute edition of the Campaign HQ programme. BritainAndAmerica.com is very proud to have sponsored 18DoughtyStreet.com's two minute advertisement that imagines a world without the USA. It is impossible to make detailed arguments inside two minutes but the advert points to the many political, economic and technological benefits of an outward-looking America. This website is a passionate believer in the special transatlantic relationship and will continue to fill these pages with arguments against the anti-Americanism that is sweeping too much of Europe. 18DoughtyStreet.com's Campaign HQ are now at the voting stage of their World Without America ad campaign. You can see the three competing concepts here and vote for the one you'd like to see converted into an ad. 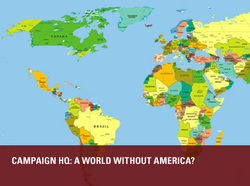 18 Doughty Street has today announced the theme of its next campaign video - "The World Without America". The campaign is being run in conjunction with BritainAndAmerica.com. Your input will be integral to how the video turns out. Click here to comment on what you would like to see the video feature. Three judges will champion one idea each, you will vote on which shortlisted idea is your favourite, and a professional video will be produced within a week. Perhaps the video could focus on what the world would be like with China being the sole superpower, or on how the EU would react to losing the America's defence umbrella and trade.